The allure of Provence, France, beckons with the sweet fragrance of lavender and historic sites of medieval towns. All photography in this article is the copyrighted works of Brian Jannsen unless noted. Unauthorized use is prohibited. Perhaps the most sublime in all of France, Provence evokes images of medieval towns, hills of lavender fields swaying in the breeze and the sweet romance of the sea. Stretching from the Alpine mountains through the meandering Rhône River valley before surrendering to the Mediterranean, the lands of Provence promise the most delightful and dramatic landscapes around every bend in the winding roadways throughout the region. Stop by one of the hilltop towns alive with bustling marketplaces and festivals throughout the year celebrating both the spiritual and secular. In the countryside, you’ll find rolling hills of lavender bursting with life and filling the air with the most intoxicating perfume imaginable. Later in the summer, fields of sunflowers bathed in golden light seem to disappear into the horizon. Perhaps it’s the romance of the sea that beckons? Head to the south of this region to Saint Tropez and Nice and let’s not forget the glitz and glamour of Cannes! It’s all here in Provence, France. Throughout Provence, you'll motor along meandering tree-lined roadways such as this one near Saint-Remy-de-Provence. Photo: ©Brian Jannsen. Unauthorized use is prohibited. Ah, but the undeniable allure of Provence is its light. Imbued with a unique quality of light that has lured many a brush and pen to this region, Provence was and is home to not only visual artists but writers as well. From Van Gogh, Cézanne and Picasso to Marcel Pagnol, Scott Fitzgerald and Ernest Hemingway, they were all here whether a fleeting visit or extended stay—Provence proved to be the promised land because of its uncanny ability to stir creativity that demands expression. With that said, we welcome the expressions of Brian Jannsen who brought to life Alsace and Bavaria on EuroTravelogue over the last couple of months and now, he directs his talents to the extraordinary light of Provence. As you’ll soon see, his images not only capture the beauty of the landscapes but the motion of the breezes in fields of lavender and sunflower. 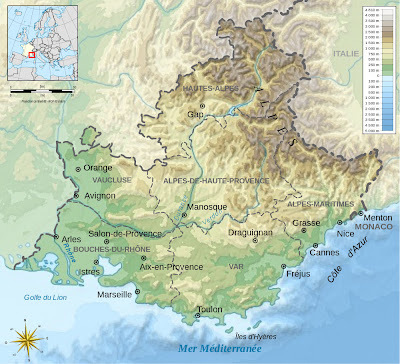 Map of Provence, France. Image: Wikimedia.org. If you’ve never visited Provence, it’s a region of France located in the southeast corner of the country and is comprised of many “departments” or counties including Var, Vaucluse, Alpes-de-Haute-Provence, Alpes-Maritimes and parts of Hautes-Alpes. 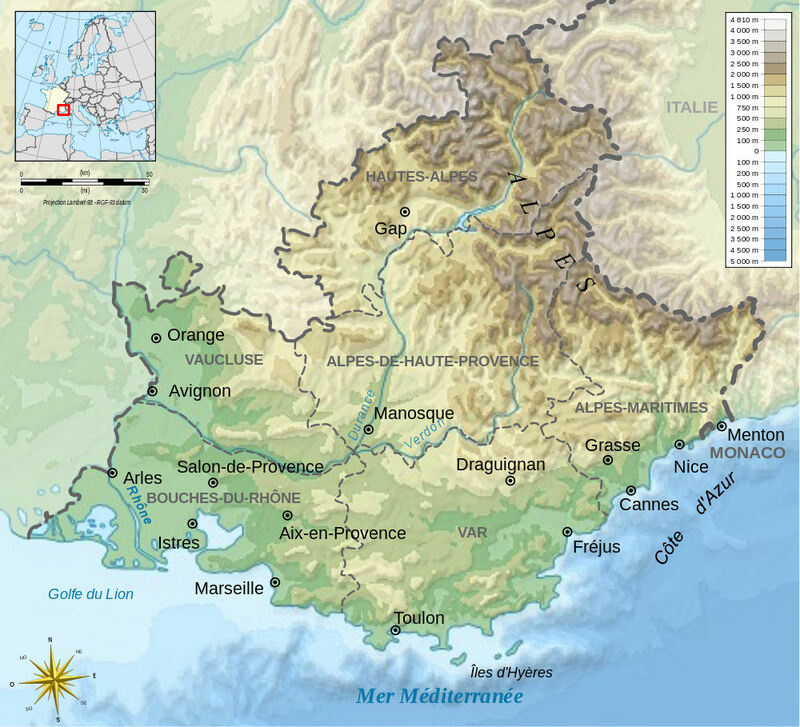 Our tour takes us through most of these regions starting with Vaucluse and Alpes-de-Haute-Provence in the north and ending with Bouches-du-Rhône and Alpes-Maritimes including Côte d’Azur in the south. At the end of this pictorial tour of Provence, find out how you learn to capture images like these on one of Brian’s photography tours planned for the upcoming year. And, Provence is on the list! Buckle up my friends and enjoy the ride through Provence, France. May it ignite the wanderlust from within as it did me! Alpes-de-Haute-Provence—medieval towns and goat cheese? The medieval village of Banon rises above the fields of lavender below. Photo: ©Brian Jannsen. Unauthorized use is prohibited. Renowned for producing one of France’s best goat cheeses, Banon’s medieval town dates back to the 11th century. Its ancient architecture beautifully preserves its historic past and as you stroll along the cobblestoned streets, you certainly feel like you’ve stepped back in time. At the top this historic citadel stands the 17th-century Saint-Marc Church, just one of many churches in the village, others dating back to the 13th century. Collectively, they provide for a fascinating journey back in time. Make sure you find your way to the original ramparts from the ancient wall that fortified Banon for the most exhilarating view of the surrounding lavender plateau. The Valensole lavender fields fill the air with an intoxicating fragrance of sweet perfume! Photo: ©Brian Jannsen. Unauthorized use is prohibited. We now head to the hilltop town of Valensole, another medieval citadel that sits upon its perch above the sprawling lavender fields alive with vivid hues of color inducing perhaps the most intoxicating fragrance in all of Provence. The town itself winds up the hillside with its medieval streets lined with beautifully restored Provencal houses, shops and cafés, not to mention the bouleangerie! Dominating its skyline is the Church of Saint Denis with origins dating back to the 11th century but most of what we see today is the result of additions and renovations between the 13th and 18th centuries. There’s also a beautiful fountain in the Place Thiers. 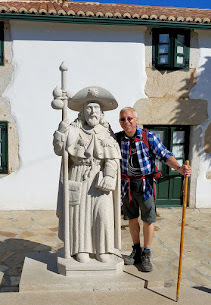 Villages of Vaucluse—Popes and monks. Gordes in the Luberon is home to the magnificent Abbaye de Sénanque. Photo: ©Brian Jannsen. Unauthorized use is prohibited. En-route to Avignon, we stop in Gordes in the Luberon, home to the magnificent Abbaye de Sénanque. Founded by Cistercian monks in 1148, the abbey remains their home and place of worship to this day. Its stone-cold façade provides a striking backdrop against the tender blooms of lavender swaying in the breeze. Avignon aka 'City of Popes' is home to one of the most magnificent and largest Gothic palaces in the world—Palais des Papes or the Papal Palace. Photo: ©Brian Jannsen. Unauthorized use is prohibited. Western Provence is home to the “City of Popes” also known as Avignon. Upon its hills, they built one of the most magnificent, let alone largest Gothic palaces in the world— Palais des Papes or the Papal Palace. The palace served as the seat of the Papacy during the 14th and early 15th centuries after Pope Clement V fled Rome’s San Giovanni de Lateran in 1305 due to the prevailing chaos after his election. In 1348, the Papal State purchased Avignon and retained control of the city until 1791 when it was reintegrated back into France after the French Revolution. The palace is a must-see on any Provencal itinerary! Bouches-du-Rhône—bustling markets, lavender and art! Later in the summer, fields of sunflowers bathed in golden light seem to disappear into the horizon. Photo: ©Brian Jannsen. Unauthorized use is prohibited. With origins dating back to the 6th century B.C., Arles features many a Roman ruin, intriguing museums, the Church of Saint Trophime with its magnificent “Last Judgment” sculpture surrounding the portal, and finally, the home of Vincent Van Gogh who produced nearly 300 works while in residence. There’s also the annual photography festival Recontres d’Arles near the French national school of photography. 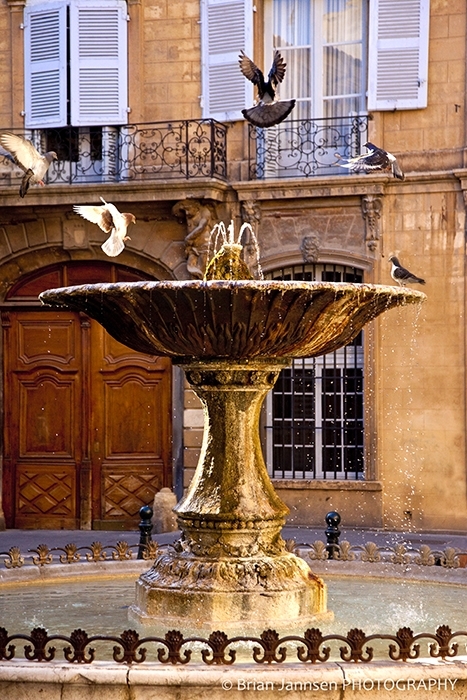 Pigeons frolicking in the fountain at Place d'Albertas in Aix en-Provence. Photo: ©Brian Jannsen. Unauthorized use is prohibited. Fresh from the harvest, delicious olives are sold in the Saint-Remy-de-Provence market—perhaps one of the best in all of Provence. Photo: ©Brian Jannsen. Unauthorized use is prohibited. Saint-Remy-de-Provence, approximately 13 miles south of Avignon, boasts one of the best local markets in all of Provence and its village is bustling with shoppers converging upon its stalls brimming with farm-fresh produce, meats and fresh-baked goods. Definitely worth a stop here! Saint-Remy was also home Princess Caroline of Monaco after a tragic boating accident claimed the life of her husband, and Vincent Van Gogh who spent his final years in an asylum in St. Paul-de-Mausole. It was here that he produced a vast collection of masterpieces most notably “Starry Night,” inspired by the view outside his window. More ancient Roman ruins lie just to the south of Saint-Remy in Glanum. Along the beautiful Côte d’Azur coastline, stands Èze with its million-dollar view of the French Riviera. This nighttime view shows Èze twinkling in foreground against Saint-Jean-Cap-Ferrat—popular with the royals and wealthy, and home to some of the world’s most expensive real estate. Photo: ©Brian Jannsen. Unauthorized use is prohibited. Located along the beautiful coastline of Côte d’Azur about five miles east of Nice and a few miles west of Monaco, the medieval village of Èze sits upon its perch overlooking the French Riviera and the Mediterranean Sea. Inside, you’ll find cobblestoned streets, quaint cafés, and don’t miss the oldest building in town dating back to 1306—Chapelle de la Sainte Croix. But it’s the dazzling views from its hilltop location that draw tourists and residents alike. The sun sets over the lavender plateau in Provence, France. Photo: ©Brian Jannsen. Unauthorized use is prohibited. And so the sun sets upon Provence, France, and our journey as well. I hope you enjoyed this tour through majestic valleys and hilltop towns, mosaics of lavender and gold, and muted blues of the sea and sky—a magical land imbued with dazzling light! If you love to travel and enjoy taking photographs or want to learn how to take photographs like these, Brian Jannsen—renowned photographer whose award-winning work has been published in books, calendars and magazines including National Geographic, Lonely Planet and Frommers—facilitates photo tours throughout Europe and the U.S. These are not photography workshops per se, but photography tours through some of the world's most picturesque setting. Be sure to check out Brian's photography tours and his online gallery of prints you can purchase in print, on cards and phone cases too! Brian-Jannsen.ArtistWebsites.com. Au Revoir from Provence, France! Lovely photos! I was fortunate enough to visit Eze on my first trip to France and I will absolutely visit it again. The rest of the region is also on my list of places to visit; can't imagine how gorgeous it is to see all the fields of lavender in person. Thanks for sharing! Thanks so much for all of your kind words and for stopping by to share in my journey through Provence! One day soon, you'll revel in the lavender fields too! Truly intoxicating! Thank you for stopping by and sharing your experiences too! Gorgeous gorgeous photos. I can almost smell the lavander! Hi Marlys! I know exactly what you mean...these pics really capture the essence of Provence and the sensorial experience of the entire region! Thank you kindly for stopping by and for your kind words! uh God.. this is amazing. i guess i'm surprised to knowing that we could find lavender in this area. Fantastic photos! You had me at medieval towns and goat cheese! I need to go to Provence. Ruangkota, I couldn't agree with you more...the pics are amazing and yes, Brian is a genius. He knows exactly how to capture the essence of everything he photographs! Thank you for stopping by to share your thoughts and your compliments! Hi Laurel, I know, I too love goat cheese and was thrilled to find out that Banon is one of France's, if not the world's leading producers of this fine cheese. Thank you for your compliments and stopping by to share your thoughts! The pictures are absolutely gorgeous! I love lavenders and have always wanted to see these fields. I can just imagine the wonderful aroma here. Thank you for sharing these pictures and Provence. Definitely adding this to places to visit - hopefully soon. I so agree with you!! Brian's photographs bring Provence to life online!! Extraordinary! Did you see the other two posts, links above in article? Alsace and Bavaria are just as gorgeous. Thank you so much for stopping by and sharing your thoughts! What stunning photos. I adore Provence,and I went expecting to dislike it, and have returned 3 times I think, over the years. The first time I went was in 1979 and really it's one of the few places which hasn't changed, essentially, in atmosphere - last time I was there was a while back, though, 2005. Oddly, I've never seen the lavender fields, but one point on my travel philosophy is to always leave a reason to return! Thanks for sharing these beautiful photos! Thank you so much for stopping by to share your experiences as well. And I agree that Brian's photos really capture the essence of all that Provence has to offer its visitors. Love your philosophy on having a reason to return as I practice that as well. Thank you again! GORGEOUS Photo's love the first one (and the others). 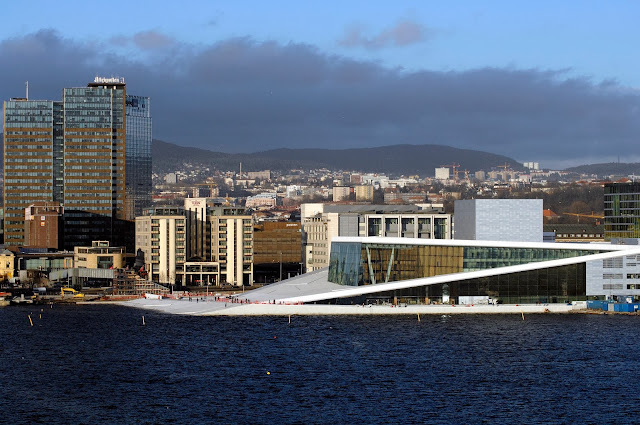 Now I really want to go, it looks stunning! Hi Claire, I couldn't agree with you more!! 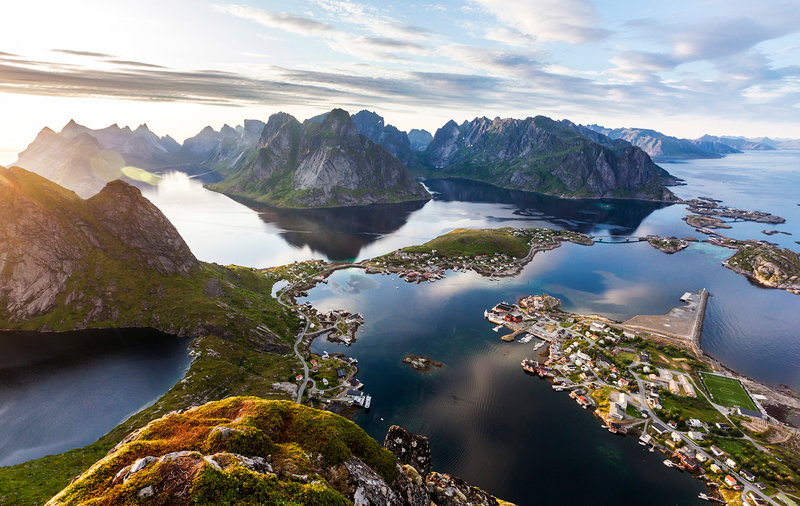 Brian's photography is quite stunning and definitely stirs the wanderlust from within. Thank you so much for stopping by to share your thoughts!! Nicely written Jeff - thanks again for including my pix... On to Zermatt?? Oh be still my heart! Pictures definitely draw me in and these make me want to jump on a plane right now. Beautiful area and one that I need to visit desperately. Hi there my Eurotravelista!! I couldn't agree with you more about this pictures igniting the wanderlust from within. I will go with you! Thanks for stopping by and sharing your thoughts. Hi Charu!!! I couldn't agree with you more...Brian's photography is stunning! I love to feature posts with his brilliant and inspiring photos...our next journey will be Zermatt! Thx for stopping by and sharing your thoughts!! C'est bon! Magnifique! Make me want to return ASAP. Thanks for the inspiration. Hi Jeff, I can totally relate to you how Brian's photography ignites the wanderlust that lies within!! Thanks so much for stopping by to share your thoughts...and I am ready to head to Provence!! Beautiful photos of the lavender fields. I have yet to make it there and they are practically around the corner. Hopefully I will see them up close and in person this year. Hi there Ashley!! Thx so much for stopping by and for your compliements. I will be sure to share them with Brian...he's extraordinary! Hope you get to see this beautiful countryside and take the time to smell the lavender!! Have FUN!!! Beautiful photo's .Thank you for sharing a good memory's. We use Lavender for cooking,In drawers,soap,shampoo,candle,Robe,Sleeper's,heated pillow's for neck and the back pain,and more.Thank you very much for the wonderful pictures. Hi there Marie and thank you for all of your wonderful compliments and notes about lavender! I agree, these photos by Brian are exquisite and the scenery is quite breathtaking. Thank you again for stopping by. Wow, what lovely photos and compelling writing. I have visited parts of Provence, but always missed out on the lavender fields. I do remember the smell, though. I need to go back - thank you for this moment of "calm". Much needed ! Hi there my friend and thanks so much for stopping by and sharing your thoughts!! I will be sure to pass your comments on the photography to my guest Brian who provided exquisite impressions of Provence for my article! These beautiful photographs and your lovely article certainly cheered up a dark November day in Ireland for me - the road to St. Remy is one of our favourite drives ... we are lucky to have a little house in this region and never tire of visiting and exploring new places. The last time we were there they were cutting the lavender around our house and the smell was heavenly - counting the days until our next visit. Hi there Debby and thank you so much for stopping my, your lovely compliments and sharing your love of Provence with my readers. You truly are fortunate indeed my friend to have a house in this sublime region of France. Perhaps you'll send me some pics from your next visit. Thank you again! Beautiful photos! My husband and I spent a week in Eze on our honeymoon and a couple of years ago spent two weeks in Gordes with our kids and spent our days visiting all the towns and villages in the area (including a day trip back to Eze). Unfortunately, the lavender bloomed early the year we visited and I missed it so I have no choice but to return! HI there Lisa and thank you so much for your kind words and compliments. I will be sure to pass those along to Brian! Wow, two weeks in Eze...must have been extraordinary! And yes, always leave a destination with a reason to come back for more! My traveling philosophy! France really a beautiful country. On my recent trip I was at Aix en-Provence, a nice place and I really enjoy there. Nice city with nice people. I really impressed with culture and architecture. Hi there Victor and thank you so much for stopping by and sharing your travels through Provence! The entire region has so much to offer, it's no wonder that I have fallen in love with it! Hi Jeff! It's comments like this that really fuel my ambition to keep writing and providing content for visitors like you! You really made my day and weekend as well. Thank you so much for sharing your thoughts. Please stop back when you get back from your trip next year and let me know how much you enjoyed it! okay? Hi there Tricia! I couldn't agree with you more about Brian's photographs ... I call him the master of light and lens, and he truly is!! And I too need to visit during lavender season ... perhaps with you!! ; ) Thx so much for stopping by to share your thoughts!! Lovely article and pictures! I lived in the Provence for a year, in Lourmarin. It's simply stunning there. Hi there my friend! Thank you so much for stopping by and for sharing your story. It must have been wonderful to live in Provence, I just love it!! Jeff, once again you are inspiring me to jump on the closes plane to France... but alas we have to wait until June of 2014. Can't wait - thanks for the beautiful article and most excellent photographs! Hi Deborah and thank you so much for stopping by and for sharing your kind words! 2014 is right around the corner and I look forward to your journey as well!! Beautiful pictures! How to reuse copyrighted photos on our blog? Hi She. Thank you so much for your inquiry. Please contact Brian Jannsen via the link above. Thank you. Once again your photos are fantastic. Thanks for giving us a taste of Provence ! Hi there Jenny!! Thank you so much for your compliment but all credit for these photos goes to Brian Jannsen! Thx so much for stopping by and for your wonderful compliments. I have now fallen in love...with a place...at the sight of which you have taken my breath! Hi there my Anonymous friend. That's the magic of Brian Jannsen, the master of light and lens! Thank you so much for stopping by and for your kind words! Absolutely gorgeous photos! Stumbled upon these today as I'm planning our first trip to Provence this June! Can't wait to explore this region and see the lavender fields in person. Thanks so much for sharing! Hi there Joy! I am thrilled for you to be visiting Provence this year! Please stop back here upon your return and share some of your exciting news and tips! Thank you so much for stopping by! I cycled through Provence in May several years ago and found the countryside to be absolutely delightful. It's the sort of place where I could easily see myself in a place for a month - so I had empty days to explore the hidden corners of the region. The photos really highlight just how beautiful it is. Hi there Leigh! What a wonderful experience that must have been, to slow travel through Provencal countryside and really soak up its splendor and culture! What I wouldn't give for a similar experience. Thank you for stopping by and for your kind words!! Hey...thanks for the amazing article! True inspiration! We visited Provence a couple of times briefly.. loved the villages St. Remy, Arles etc. there! Attended a wedding actually next the the lavender fields... that was magic. Love your photos & dream of going back some day! Hi there Akshay! Thank you so much for all of your kind words! Indeed, Provence is magical. Glad to hear you have such wonderful memories!